Don't just clean it - blitz it. Blitz the windows with smear free shine. Blitz the bathroom with almost 70% bigger sheets. 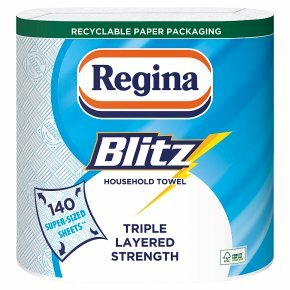 Blitz any spills with super absorbency. Blitz the dust with triple layer strength. CAUTION<br>Do not flush<br>Always test with cleaning products as solvents may cause colour to be transferred.<br>To avoid risk of suffocation, please keep this plastic wrapper out of the reach of children.